Expecting house guests soon? Don’t stress. I am a frequent house guest when I visit my family on the east coast and have hosted others in my home. 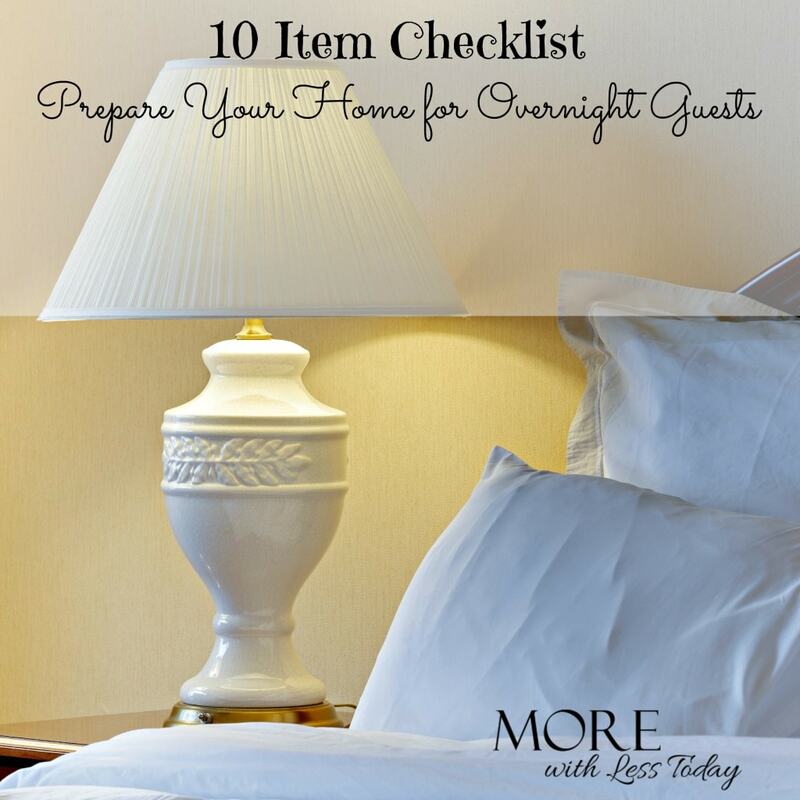 I have compiled my ultimate checklist to prepare your home for overnight guests. 1. Gather “things to do” for your house guests from local attractions, places of interest, shopping, and from their hobbies. If they exercise, offer a guest pass from your gym. If you have coupons for local entertainment, save them for your guests. Do not feel like you have to accompany your guests on every excursion. Prior planning prevents misunderstandings. Let your house guests know when you are available to play tourist with them and those times when they will be on their own. You might want to give them a copy of the house key and alarm code so they can come and go easily. Be sure and give them your wifi code and password. If the grownups want a night out, arrange for a trusted babysitter. 2. A meal plan mapped out ahead of time can save money and frustration. Aim for “dollar-stretcher” meals, cook-once-and-use-twice meals. Use your slow cooker during the day so dinner is ready at night. Make some easy desserts ahead of time too. Show your guests where to find snacks and water so they don’t have to rummage around. 3. Give them space to unpack. Living out of a suitcase for any length of time is not ideal. You can find laundry baskets at the dollar store. If time is short, just declutter your closet items into the laundry baskets and stash them away to free up some space for your guests. Offer them some clothes hangars too. 4. Keep the bathroom stocked with extra TP, sanitary items, a plunger, and a basket or cup for their toothbrush. Now is a great time to display all the little toiletries we tend to gather from our travels and let your guests use them up. If you have a TV in your guest bedroom, show the guests how to work your remote and make sure they have fresh batteries. 5. In the bedroom, provide a night light, tissues, ear plugs, an eye mask and an extension cord to charge their gadgets if you don’t have adequate outlets. 6. If your linens and mattress have seen better days, now is a great time to purchase some new sheets, towels, and washcloths. I like to use white for my family and then colored linens for my guests which I keep out of our daily rotation so they stay nice for future guests. If your mattress is old, consider getting a new cushy mattress pad. 7. Be sensitive to temperature preferences. I live in a warm climate and when I visit my family in New York, I am always freezing. They keep the house cold and walk around in t shirts in 50-degree weather. We wear sweatshirts when the temperature dips below 70. I always need extra blankets and when they visit me, they always need a fan or the air conditioning cranked up. 8. Does the house need some sprucing up? A few inexpensive ideas include replacing old glasses, silverware, dishes and coffee cups. I like to use all white and then add place mats and decor for each season. Plant some new flowers near your entrance, replace an old welcome mat, add a wreath to the front door, buy new candles, and add fresh flowers to each room. 9. Not everyone likes pets and some people are highly allergic. It’s best to sort this out ahead of time. If your beloved pets can be a pest, you may need to keep them out of your guest’s bedrooms. 10. Walk through your home as if you are seeing it as a guest and try to anticipate what your house guests might need to make their stay comfortable. Having overnight guests can be a great catalyst to getting some of those home improvement project done with a deadline! Did I forget something? I welcome your ideas for hospitality in the comments! Those are all great tips, thanks! Great tips! We live in Orlando, and entertain frequent guests who want to visit the Mouse House. Some other tips I have are obvious: keep a notepad and pens/pencils/sharpie/scissors on a nightstand. Also leave your complete address, phone number(s), and email- you’d be surprised at how many times guests have this info at home, but forget to bring; leave instructions to the washer/dryer- most guests will want to clean their linens or towels or soiled clothes, before departing. If you live near a beach or pool, designate a bag for guests stocked with towels, sunblock, goggles, insulated cooler, etc. that they can borrow. A little note of “thanks for being our guest”, is always a nice touch.